April 12, 1963 King along with approximately fifty others were arrested on Good Friday in Birmingham. M. L. King decided to ignore a recently passed ordinance that prohibited public gathering without an official permit. This would be King’s 13th arrest. King did not want to be quickly bailed out, but chose to stay longer to draw attention to the situation. On April 12, a Birmingham newspaper was smuggled into King, in which was written a critical letter against King’s actions, written by eight local Christian and Jewish religious leaders. They thought that King should not interfere with issues that were Alabama’s issues. The thrust of M.L. King’s argument was that we as blacks in America can no longer wait. It is time to take action. Many did not agree with King. 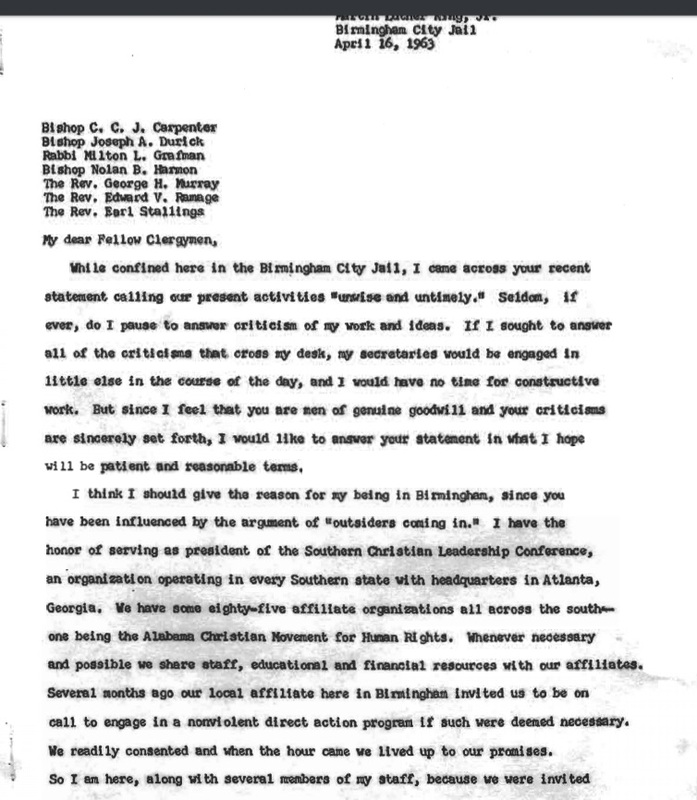 The “Letter” was a response to criticism which Martin Luther King received from other clergymen about his actions. King’s response was basically ignored until — on May 19, 1963, the Sunday edition of the New York Post Magazine published various excerpts of his letter. The decision by the New York Post to publish some excerpts — along with the persuasive argument and words of King — caused other publications to print the full letter. In the book, “Why We Can’t Wait,” written by Martin Luther King, the whole letter was included. King also recorded himself reading the letter. Here are several excerpts from that first letter. KING: You deplore the demonstrations taking place in Birmingham. But your statement, I am sorry to say, fails to express a similar concern for the conditions that brought about the demonstrations. KING: We know through painful experience that freedom is never voluntarily given by the oppressor; it must be demanded by the oppressed. Frankly, I have yet to engage in a direct action campaign that was “well timed” in the view of those who have not suffered unduly from the disease of segregation. –then you will understand why we find it difficult to wait. There comes a time when the cup of endurance runs over, and men are no longer willing to be plunged into the abyss of despair. I hope, sirs, you can understand our legitimate and unavoidable impatience. You express a great deal of anxiety over our willingness to break laws. This is certainly a legitimate concern. Since we so diligently urge people to obey the Supreme Court’s decision of 1954 outlawing segregation in the public schools, at first glance it may seem rather paradoxical for us consciously to break laws. ← Today’s Illustration: Isn’t “Why” A Fair Question When This Happens?